Water is a key part of our theology through the sacrament of Baptism and water is certainly a vital part of our lives. In Michigan, we are all familiar with the contaminated water crisis that continues to affect the lives of our neighbors in Flint. Having my home on a small lake in Hillsdale, I am always aware of the value of clean water for the health of the lake and its resident population of fish, frogs and turtles. As Michigan residents, we all need to be conscious of any decisions and regulations that might impact the beautiful waters of our amazing Great Lakes. On March 18, 2017, the Diocesan Council adopted a Resolution that “our brothers and sisters in faith request that Governor Snyder utilize the State’s authority by acting immediately to cause Line 5 to be restricted to not more than 300,000 bbl per day and its cargo be limited to non-oil products until the recommendations of the Michigan Petroleum Pipeline Task Force have been satisfied and an independent panel of pipeline experts has verified that Line 5 is safe.” EDOMI thus joined the other three Episcopal Dioceses in Michigan in adopting this resolution. The adoption of the Resolution was reported in Nuts and Bolts. The Michigan Pipeline Safety Advisory Board recommended in 2015 that the state of Michigan enter into two contracts for two independent studies on Enbridge Line 5 to get further information upon which to develop remedies and base its recommendations to the state of Michigan. Both studies were to be funded by Enbridge Energy, and both were scheduled for release around the end of June 2017. Agencies of the state of Michigan contracted with the firm Det Norske Veritas for an independent study of the financial cost of a potential worst-case scenario oil spill from Enbridge Energy’s Line 5 under the Straits of Mackinac. However, in May 2017 the Board discovered that Norske Veritas failed to follow conflict of interest rules. On June 21, 2017, the state fired the firm for conflict of interest https://mipetroleumpipelines.com/document/termination-dnv-gl-independent-contractor-line-5-risk-analysis; reported in https://midwestenergynews.com/2017/06/21/michigan-terminates-contract-for-enbridge-pipeline-study-citing-conflict-of-interest/). The second study was performed by Dynamic Risk Assessment Systems of Calgary, Alberta, and is an analysis of alternatives to the current pipeline. The state received a draft of this report on June 22, 2017, at 10:00 PM. Initial review of the report by the state revealed that at least two points from the Statement of Work in the contract for the study were not covered or included in the draft. These points were lack of clarity on how the contractor determined “worst case” scenario for a spill, an incomplete analysis of how long the pipeline can be expected to operate before replacement as well as a failure to address the effects of excessive span lengths before 2005. Dynamic Risk amended the draft report, and the state released it to the public on June 29, 2017. The full 337-page revised draft report can be found on the Pipeline Safety Advisory Board website at https://mipetroleumpipelines.com/. This site also gives the schedule for a public information session on July 6, 2017, in Holt, MI, where representatives of Dynamic Risk will report their findings. Three public feedback meetings are scheduled on July 24th and 25th in Holt, Traverse City, and St. Ignace. On June 29, 2017, Michigan Attorney General Bill Schuette called for a plan for the closure of Line 5 (http://on.freep.com/2ttByyl). Major problems with the pipeline had emerged prior to the receipt of the Dynamic Risk Assessments report: delamination of the outer coating on the pipes and lack of adequate supports between the pipelines and the lake bed. The loss of the outer coating of the pipeline in 18 places is a concern. A work plan filed in September 2016 by the U.S. Environmental Protection Agency described these sections as “holidays,” meaning that all the coatings on the pipeline were absent at these spots, down to the metal of the pipes themselves. 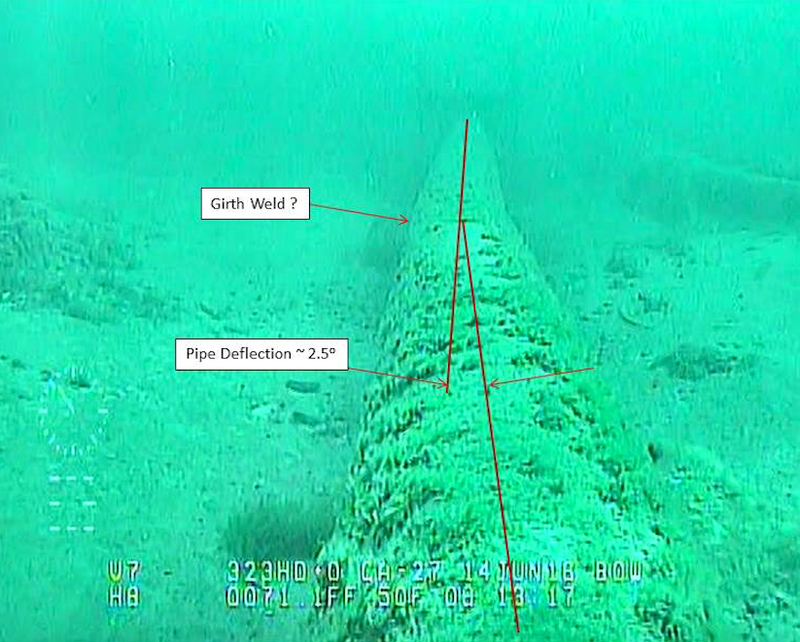 Enbridge admitted in March 2017 that the outer coating on the pipes was missing (“delaminated”) in these spots, but that these were not full coating “holidays,” and Enbridge says it does not repair delaminations of the outer coatings (http://www.mlive.com/news/index.ssf/2017/03/enbridge_line_5_delamination.html). It is still unclear whether the pipeline metal is exposed to the environment at any points. One engineer quoted in the same article argues that “currents near the straits bottom are higher velocity and more complex than the pipeline’s original designers at Bechtel Corp. realized, and the combination of stress over time at key locations has fatigued the metal in ways that can’t easily be seen or measured underwater.” This, together with the inadequate number of anchor supports, may have caused stress on the pipelines for the past 64 years. A bent pipe in the west pipeline was discovered from viewing a 2016 inspection video. Whether this is from lack of adequate support or from action of the currents over time (or a combination of these factors) is not clear. It is also not clear yet whether the Dynamic Risk report addresses this issue. Enbridge says that it has monitors that detect spills; however, the 2010 Kalamazoo River spill went undetected for 18 hours, even though an alarm went off in Enbridge’s Alberta headquarters. Human error seems to have misinterpreted the alarm. Alarm system notwithstanding, Enbridge did not respond appropriately to the spill until a utilities worker in Michigan saw the spilling oil and called Enbridge’s emergency number. (http://www.loe.org/shows/segments.html?programID=12-P13-00027&segmentID=1). 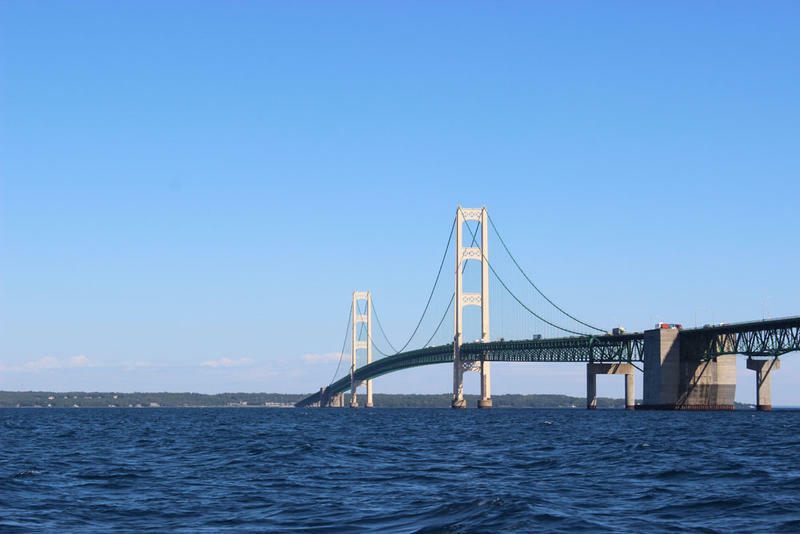 Since the Enbridge Pipeline 6B oil spill into the Kalamazoo River in 2010, the largest inland oil spill in U.S. history, environmental and other groups have focused attention on Enbridge Energy’s 64-year old Line 5 Pipeline under the Straits of Mackinac. In 2016 the Midwest Alliance of Sovereign Tribes (MAST) asked for the immediate closure of Line 5. The organization’s acting president said, “Our waters are sacred to the original people as we have depended on these glacial waters for sustenance since time immemorial” and that “[a] spill is imminent” (http://www.sooeveningnews.com/article/20160429/NEWS/160428584). Closure of Line 5 has gathered bipartisan support as more elected officials review the risks to the Great Lakes and the State of Michigan from potential leaks of Line 5 (http://www.bridgemi.com/public-sector/democrats-and-republicans-agree-shut-down-enbridge-line-5). A wide variety of interests in Michigan are coming together to support safer alternatives to Line 5 under the Straits. Although it has not been a focus in the discussions on Line 5, its terminus of in Sarnia goes under the St. Clair River. A leak there would put water supplies at risk. In addition, research has found that there have been a number of on-land leaks along Line 5 over the years (http://www.mlive.com/news/index.ssf/2017/04/enbridge_line_5_spill_history.html). The on-land pipes have had problems with their longitudinal seams; the pipes in the Straits do not have these seams. Line 5 not only crosses at the Straits and the St. Clair River; it also crosses 360 other Michigan waterways on its 645-mile journey from Superior, Wisconsin, to Sarnia, Ontario. For the Fourth of July, former Michigan attorney general Frank Kelley invited me to watch fireworks from the porch at the Captain’s Quarters overlooking the harbor on Mackinac Island. From there, I could see fireworks simultaneously from Cheboygan and Mackinaw City, in addition to those being fired from a barge not far offshore from the island. They are capable of carrying as much as 540,000 gallons of oil a day. 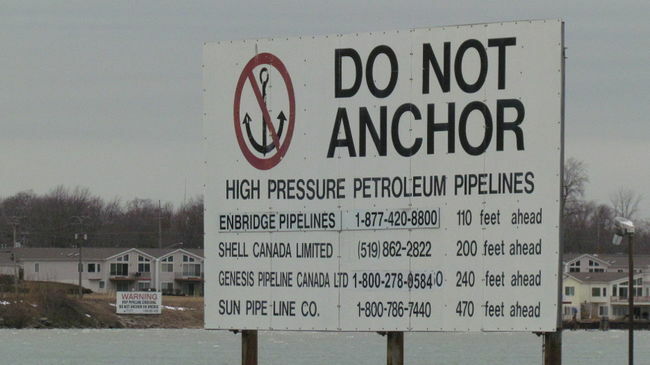 Enbridge Energy, the Calgary-based firm that owns them, believes they are perfectly safe, and last week, the state of Michigan released a report that said Line 5 could operate into the foreseeable future. The report was done by a company with the curious name Dynamic Risk. Now, it’s nice to know that they think Line 5 is safe, but not especially reassuring. For one thing, Enbridge thought its oil pipeline near the Kalamazoo River was safe before six feet of it ruptured seven years ago this month. The resulting spill took years and cost more than $1 billion to clean up. It’s also worth noting that when the spill set off alarm bells at Enbridge, workers didn’t realize at first that a pipe had broken. They thought it was only blocked, and to try to clear the pipe, they increased pressure and pumped more oil into the spill. Earlier this year, Senator Gary Peters told me he’d asked the Coast Guard whether they could deal with a Line 5 break. The answer was no. Talking purely conservative common sense here, there is no way any sane government should tolerate something that could easily destroy two of the greatest lakes in the world. Michigan Attorney General Bill Schuette has something in common with Line 5. Both came into the world in 1953, 64 years ago. Now, Schuette has called for the pipeline to be shut down, under a “specific and definite timetable,” which sounds very good, especially if you are running for governor, which he is. But it also sounds like a friend of mine who will cheerfully tell you that, yes, he needs to diet and start exercising, and that he intends to do exactly that. Yet he won’t commit to a date when he will start. Nor will Schuette offer a date by which time Line 5 should no longer be in service. Now, a number of environmental groups have said the attorney general has the legal power to shut it down now. Bill Schuette has not, to the best of my knowledge, weighed in on that. But we should demand that he, or any other politician wanting statewide office, say exactly what they would do with Line 5, and when. The Dynamic Risk analysis they gave the state also presents several well-thought out safer options, complete with costs. We need to pick one. A major oil spill in the Great Lakes would be the one thing our environment and economy might never overcome. So the bottom line is that this is one place we can’t afford to play politics. It’s really as simple as that. Thank you to Joyce Munro for her continued attention and fine research on this important topic. we praise you for the gift of water. who marks our adoption as children with the sign of water: we thank you for the gift of water. to the honor and glory of your holy name. Amen.